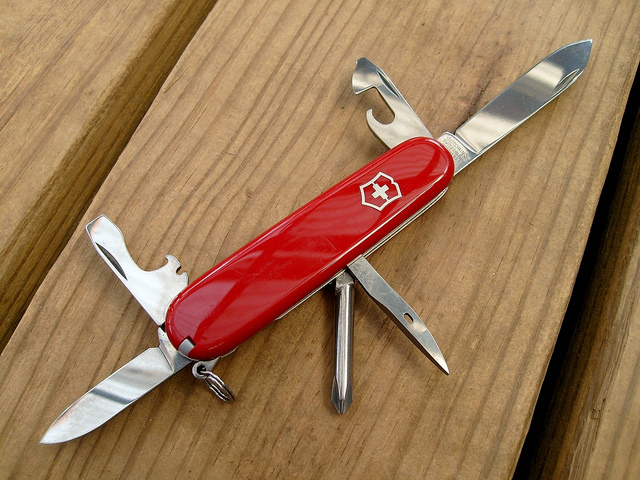 Swiss Army Knife, James Case, Flickr.com. The knife was my first experience as a kid with the joys of survival, made even better by it being useful and slightly dangerous. I still have mine from the Virginia Beach A&N store. Often “any old thing” comes at us, and we are not prepared. TV weathermen and reporters tell us to fill our cars full of gas well before a hurricane, and to keep three days supply of food, and to have key personal papers in a safe place, and to keep a well-stocked medicine cabinet. Terribly sensible stuff. We know this, and yet as we see our news, hardly any are ready. Indeed, those who prepare well are marginalized as reality show “preppers”, sort of wing nuts who seem to be hoping for the worst as we secretly admire their pluck and grit. But that is not the reality; hundreds of thousands of people were and are Boy and Girl Scouts, and Bear Grylls, friend to the Royals and Presidents, is celebrated even as we do not follow their advice.